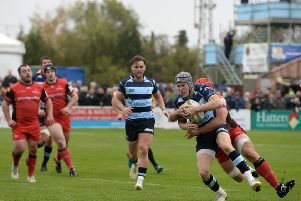 Bedford Blues blew a 17-0 half time lead as they succumbed to a 32-17 defeat against Worcester Warriors on Saturday. Playing in front of a big Goldington Road crowd, the Blues dominated the first half, thanks to tries from Villiami Hakalo and Pat Tapley. However league leaders Worcester dominated the second 40 by scoring four tries and racing to a bonus point victory, leaving those wearing blue wondering what might have been. The win for the visitors stretches their winning run to a remarkable 22 matches whilst Bedford sit eighth in the Greene King IPA Championship standings. Forced to play down the slope in the first half, the hosts made all the early running and put the league leaders under pressure with their huge hits in defence. With their first threatening attack of the match, Bedford managed to collect points via the boot of fly-half Jake Sharp, the former Saracens man sliced the posts with a drop goal from 30 metres out. Blues’ supporters’ cheers were only to grow louder as the half wore on as they watched their side be ruthless in defence and dangerous in attack. A quarter of the way into the match saw the first try via Tongan international Hakalo. The powerful centre intercepted a pass in midfield and ran 50 metres unopposed to ground under the sticks. Just 10 minutes later, it was a sense of déjà vu as another turnover – involving Hakalo – led to Tapley scoring Bedford’s second. The centre managed to turnover Worcester possession before giving the ball to his team-mate Tapley, with the winger was able to sprint over in the corner and score the second five-pointer of the afternoon. Both tries were converted by James Pritchard and the Blues led 17-0 at the break, with a score line that was no surprise in the context of the match. Facing their first defeat since the opening day of the season, Worcester were desperate to fight their way back into the match and they did just what was required in the second half. After a misplaced pass allowed a Warriors scrum five metres out, Dean Ryan’s side were clinical down the blindside as Sam Smith bundled his way over to score. With Bedford being forced to defend, ill-discipline became an issue as two Andy Symons brought the visitors within one score as the fitness of the Blues players were being pushed to the limits. Referee Thomas Foley began to get impatient with the amount of penalties both sides were conceding, and sent both sides down to 14. Worcester prop Nick Schonert and Bedford substitute Paul Tupai were sent to the bin just after the hour mark, leaving both teams stretched in the forward pack. In the 72nd minute, that impact allowed the league leaders to take the lead for the first time. Bedford had a scrum, but forcing Hakalo into the back row with the Warriors choosing to have a full forward contingent allowed a turnover to happen. The ball went into midfield and with the Blues backline unorganised, Warriors fly-half Ryan Mills danced his way through the opposition to score under the posts. The extras were easily added by Symons, and the league leaders were ahead by a point. Bedford’s earlier exertions looked to have been catching up on them, as Worcester had enough time to score more two tries to bag their bonus point win. First, a rolling maul allowed Sam Betty to ground in the corner after the referee discussed with his assistant. The score meant the Bedfordshire side were unable to claim a losing bonus point, and their woes were compounded with the last play of the game. Worcester won a turnover before giving the ball to Tom Biggs, and the pacey winger was able to run over in the corner and secure a win that may have looked comfortable on the scoreboard, but was far from that for the side looking to make an instant return to the Premiership. Bedford: Billy Moss (Camilo Parilli-Ocampo 55), TJ Harris (Charlie Clare 64), Phil Boulton (James Currie 55), Mike Howard (Paul Tupai 64), Ben Gulliver, Justin Blanchet (Hayden Thompson-Stringer 45), Nick Fenton-Wells (c), Joe Vandermolen, Pete White (Darryl Veenendaal 50), Jake Sharp (Steffan Jones 60), James Pritchard, Viliami Hakalo, Henry Staff, Pat Tapley, Baden Kerr. T: Viliami Hakalo, Pat Tapley. C: James Pritchard x2. DG: Jake Sharp. Worcester: Ryan Bower (Dan George 65), Niall Annett (Val Rapava Ruskin 65), Nick Schonert, James Percival, Darren O’Shea, Mike Williams, Sam Betty, GJ Van Velze (c); Jonny Arr (Charlie Mulchrone 64), Ryan Mills, Tom Biggs, Andy Symons, Max Stelling (Ignacio Mieres 76), Sam Smith, Ben Howard. Replacements not used: Mike Daniels, Mat Gilbert, Dean Hammond. T: Sam Smith, Tom Biggs, Ryan Mills, Sam Betty. C: Andy Symons x3. P: Andy Symons x2. Assistant Referees: Paul Burton and Chris Sharp.